Scale Model Solar Systems are pretty cool. Currently the largest one is in Sweden with a bigger one under construction in England. What if there was a model that spanned the United States? 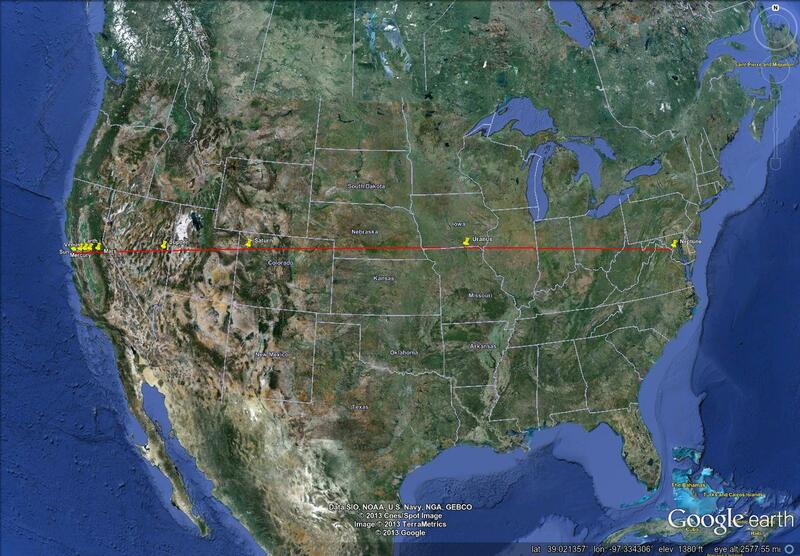 I decided to use the distance from San Francisco to Washington DC as a base length of 3932km (from Wolfram Alpha). Then I took the average AU distance of the planets (ending at Neptune) as a percentage and converted that to km in the SF to DC distance. Here is the spreadsheet I made for the data. I used Google Earth to estimate the location of each planet in the US. Here is the map of the points on Google Maps. Scaling the planets according to this ratio (also on the spreadsheet) unfortunately results in a 1,200m diameter sun in SF. The most practical way would probably be to use a different scale for the planets, and use a 1.2m (diameter) sun in SF, and a 4cm mercury. Yes, I did post this on Reddit first, to make sure my math was correct.